The Worcester Bosch Junior 24i is one of two combi's designed for small domestic properties such as a one-bedroom flat with a single bathroom. As well as saving space, they can also be installed in a number of tight or awkward locations due to their size. The Juniors are also compatible with a choice of optional heating controls. There is also a 28kW (found here) version which would be suitable for a larger flat or small semi-detached house. 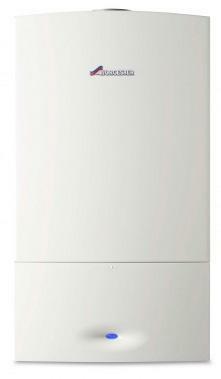 As with all combi boilers it produces hot water straight from the mains. The junior 24i is one of the most popular small combi boilers and, as with all Worcester Bosch products, benefits from great customer and installer reviews. It's light (only 27.1kg) and measures 71x40x33cm (hxwxd) so will fit inside most standard kitchen cupboards. It comes with basic controls are neatly hidden behind a facia board. You get a reset control button but no on/off switch an Eco mode and space for an optional timer which you can have added. As with all heating systems, to get the highest efficiency you'll need to add extra external controls to your heating system such as a room thermostat and TRV's (Thermostatic Radiator Valves). All Worcester Bosch boilers are recommended by the Energy Savings Trust so you know your good when it comes to efficiency. All products in this range are A-rated, high-efficiency, condensing models. With them, central heating temperatures can be controlled, with hot water instantly available. These boilers are wall mounting and also environmentally friendly due to low NOx and CO2 emissions. Want something with a higher flow rate? Check out the 28kW Junior model here.